Coming as a response to the USN requirement for a new long-range, carrier-based bomber, the Skyraider was designed in the early 1940s by Ed Heinemann of Douglas Aircraft. The aircraft was meant to fill in the large whole to be left by the Helldiver and the Avenger. The initial model of the plane was designated as the XBT2D-1 which was first flown in March 1945. The USN began evaluating the plane a month after which eventually led to the plane’s military employment in 1949. The A-1H Skyraider, in particular, was powered by a 2,700hp Wright R-3350-26WA radial engine. It had a top speed of 322mph, a range of 1,144 nautical miles, and a climb rate of 2,850ft/min. Its armaments consist of about 8,000lbs of ordinance and four 20mm M2 cannons. The aircraft series was named AD (AD-1 to AD-7) until it was re-designated as the A-1s in 1962. The Skyraider mainly served as an attack aircraft, flying support and defense missions. Its main employers were the USN, the USMC, and the USAF. But during its life, the A1-H Skyraider was also used by the British Royal Navy, the Air Force of the Republic of Vietnam, and the French Air Force. Perhaps the biggest skirmish the plane saw was the Vietnam War wherein it flew as a medium attack aircraft, combating the Mikoyan-Gurevich MiG-17 and the MiG-19 (J-6). When you talk about the history of US aviation, it’s impossible not to mention the Skyraider. With its long service period and notable involvement in a lot skirmishes, the A-1 is definitely a name to remember. 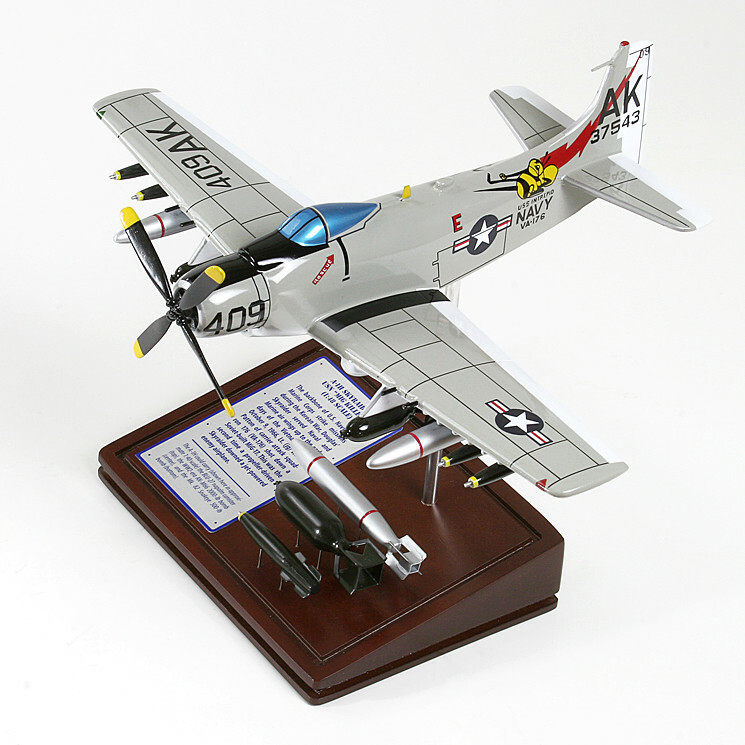 As such, displaying a quality aircraft replica of it is a must for any warplane collector.